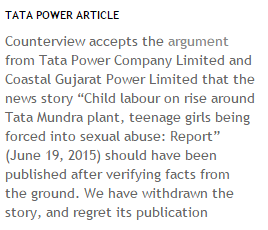 This is with reference to the article titled ‘Child labour on rise around Tata Mundra plant, teenage girls being forced into sexual abuse: Report’ published by Counterview on June 19, 2015. The piece has a series of misrepresentations and misinformation that defames the reputation of Tata Power and Coastal Gujarat Power Limited (CGPL). CGPL and its parent company are not only extremely ethical and compliant but also respond to a very strong moral code. We would like to bring to your notice that in the article there have been several allegation and insinuations made. It is extremely distressing to notice that Tata Power and CGPL has been alleged of such false allegations as loss of livelihood, loss of education, underage employment and the most distressing of all physical and sexual abuse. The company does, however, takes such concerns very seriously and will be looking into the issues raised to ensure that the safety of all is ensured and when necessary we will always seek to do more to improve and strengthen processes and policies. Tata Power has always been and will remain committed to the communities in and around its areas of operation. We have several processes in place to check any discrepancy within or around the system. This story on your site has also created serious damage to residents of Mundra by misquoting them. In fact we have reason to believe that the people mentioned in your article may not have been contacted by those developing the report. We would request you to please immediately remove your online story and also publish an immediate clarification to give your esteemed readers the correct perspective. In addition, going forward and in line with your editorial policies, we request you to reach out to Tata Power for our response on such stories before they are published.